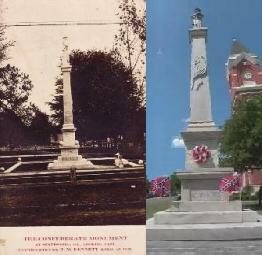 The Ogeechee Rifles Camp #941 is currently working on a project to renovate the Confederate Monument on the courthouse lawn in Statesboro, Georgia. Below is the Scope of Work information for the project. 1. Dismantle monument onsite and store on palate onsite. 2. Clean, polish, and inspect monument. 3. Inspect monument foundation for strength. 5. Upon reinstallation make sure all best sides of stones are facing outward. 6. Once monument is reassembled, place four cannon balls on the corner of the monument and fasten them so not easily removed. 7. Run electrical and install a light on all four comers of monument, also install photocell to control lights. 9. Install red Knock-Out Roses between the newly erected fence and the base of the monument with mulch ground cover. for more information on the statue, please see our Confederate Statue page: http://www.ogeecheerifles941.com/id16.html.